FILE - An Afghan police officer keeps watch at the site of a suicide bomb attack in Kabul, Nov. 20, 2018. An increase in casualties among Afghan military and police forces has prompted the Afghan government to intensify military campaigns against the Taliban and other militant groups, Afghan security officials say. Last week, Taliban insurgents killed and wounded about 80 members of the Afghan National Defense and Security Forces (ANDSF) in western Farah province, Afghan officials said. The Afghan National Security Council ordered the country's security forces to step up "offensive operations" against "armed oppositions." Tariq Arain, spokesman for the council, told VOA that government forces were stepping up air and ground operations across the country. The intent, he said is “to reduce causalities of Afghan security forces and to provide our citizens with a peaceful and secure environment." Despite casualties, Afghan security forces maintain high morale, he added. "The enemy has failed to hold a single area under its control, even for a day, which demonstrates the strength of our forces, a force that we are proud of," Arain said. FILE - A U.S. soldier directs his colleagues at the site a bomb attack that targeted several armored vehicles belonging to forces attached to the NATO Resolute Support mission in downtown Kabul, Oct. 11, 2015. Meanwhile, a spokesman for the U.S.-led NATO Resolute Support mission told VOA that NATO would assist the Afghan security forces in these "very important new offensives." "Together, we will be successful against the Taliban, who senselessly keep fighting when the ability to have peace is right in front of them. Afghan forces always survive better and kill more Taliban when they're on the offensive and moving," U.S. Army Maj. Bariki Mallya, the mission spokesman, told VOA. "It is good that the Afghan National Defense and Security Forces are on the offensive, because the Taliban must realize that they will either seek peace through talks or die." 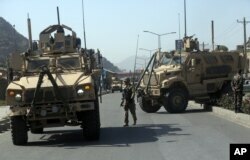 The new offensives come as the Afghan government totaled up its losses for the past three years. Afghan President Ashraf Ghani spoke last week via video conference from the capital, Kabul, to an audience at the Johns Hopkins University School of Advanced International Studies in Washington. "Since 2015, 28,529 of our security forces have lost their lives" fighting the Taliban and Islamic State (IS) terror groups "and have become martyrs for our freedom," Ghani said. Afghan security officials said in addition to the Taliban and IS, about 20 other terrorist organizations are fighting in Afghanistan. FILE - In this Oct. 31, 2018, photo, Afghan National Army soldiers participate in a live fire training exercise, at the Afghan Military Academy, in Kabul. Some analysts worry that stepping up the military action could boost civilian casualties while producing few strategic gains. "It is hard for the government security forces to fight the enemies because they hide among civilians and use them as human shields," Abdul Wahid Taqat, a Kabul-based retired general and military expert, told VOA. “Our intelligence forces are not able to identify and target the enemies. They cannot track the enemies when they leave their bases, where they receive military training and equipment and plan attacks," Taqat added. However, Walter Dorn, an Afghanistan expert and professor at Royal Military College of Canada, said he thought the planned offensive might help temporarily. "There is no purely military solution to Afghanistan's security problem, but at times offensive actions are necessary to neutralize armed opponents. Of course, this needs to be done in accordance with international law while still maintaining the moral high ground," Dorn told VOA. "On the practical level, offensives should be undertaken that will not cause more civilians to join the ranks of the insurgents." Afghanistan's conflict continues to take a civilian toll. Last month, the U.N. Assistance Mission in Afghanistan (UNAMA) said there were 8,050 civilians killed or injured (2,798 dead, 5,252 injured) in the first nine months of this year. UNAMA said 649 civilian casualties (313 deaths and 336 injuries) were due to aerial operations by pro-government forces. The U.N. report indicated that the combined use of suicide and non-suicide improvised explosive devices (IEDs) by anti-government elements were the leading cause of civilian deaths. Afghan security forces investigate at the site of a suicide bomb attack the day before in Kabul, Afghanistan, Nov. 21, 2018. On Tuesday, at least 50 people died in a suicide bomb blast at a gathering of religious scholars celebrating the Prophet Muhammad's birthday in Kabul. Another 83 people were hurt. 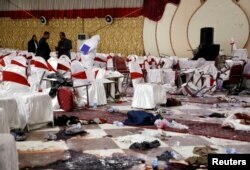 Amnesty International denounced the attack on civilians as a war crime. Armed groups must immediately halt all attacks targeting civilians and indiscriminate attacks, while the Afghan government must make the protection of civilian lives its absolute priority," the rights group said. The statement continued, "This attack also once again highlights the irresponsibility of countries in the European Union who claim Afghanistan is a safe place for refugees and asylum-seekers to be returned to." No group has claimed responsibility for Tuesday's attack. The increase in Taliban and IS attacks across Afghanistan and the Afghan government's decision to intensify its military operations against the militant groups operating in the country come amid renewed U.S.-led efforts to get the Taliban to join peace talks with the Afghan government. The Trump administration has engaged the Taliban in direct talks. Last week, Zalmay Khalilzad, U.S. special representative for Afghanistan reconciliation, concluded his second official visit to regional countries, including Afghanistan, to try to make headway in his peace mission. VOA's Ayaz Gul contributed to this report.